Since then God has used my past for His glory (Rom. 8:28), and has used me in many ministries which He has put in my path. I have never pursued any of the ministries I am currently involved in; the Lord asked if I would go and I went. The last thing I thought I would be doing after 27+ years behind the walls is going back to them! But within 2 years after my release the Lord asked me to go back in! I did, and have been part of prison ministry (weather solo or part of Prison Fellowship and Good News Jail and Prison Ministry) since 2012. 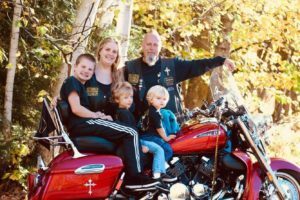 I have been part of a biker ministry since 2011, and am currently part of the Faith Riders Motorcycle Ministry of Chequamegon. After only 2 years the Lord also put me in the position of a Pastor!! In 2012 I was hired as Associate Pastor/Youth Pastor/Outreach Pastor of Faith Evangelical Free Church! In November of 2014 I received my ministry licence from the Free church after much hard work and studying under my mentor Michael Thompson. As of September 1, 2016 my tenure at Faith Free Stanley as Associate Pastor has come to an end. I have been promoted and sent. Our family will now begin our new season of life in Drummnd, WI. where I have been hired on as Senior Pastor at The Oaks Church, http://www.oaksofdrummond.com/. I also have a part time position at Crossroads Outreach in Ashland as Director of their faith based drug and alcohol outreach and prisoner reentry and mentorship outreach programs. We are excited to see what God has in store for us in the coming years. I am also a certified drug and alcohol counselor in the Almond Tree Drug and Alcohol Program, and certified in the Prepare/Enrich Marriage Counseling program. Since the very first year of my release I have been blessed with many opportunities to travel all over and give testimony and messages including: The Gideon’s conferences and conventions, schools, youth groups, youth conferences, retreats, ball games, treatment centers, aftercare programs, biker events, women’s conferences, churches, and family conferences. I was recently on the radio program “Unshackled” in a 2 part series and on the 700 Club. My biggest passion is working with our youth. I would love the opportunity to come and speak at your event, whether its a large auditorium, or a small group of people. My cost up front is free. The Gospel message should always be free. The only thing I ask is that if you are further than 50 miles from my home you reimburse me for gas or take care of travel arrangements. You can contact me here or call my phone at 715-491-7461 if interested or you have any questions. Go to the Ministries Page (Speaking opportunities) for the current schedule of events. I would also love to talk to you if you are caught up in any addictions, abusive situations, part of the occult or a gang you want out of, suicidal, a cutter, being bullied, or just plain need someone to talk to or vent to. My phone number is open to you and our conversation will be confidential. 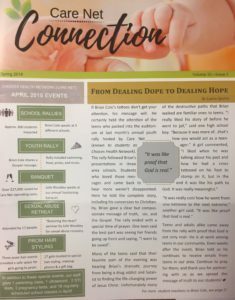 Marsha Cole – My wife, has also been radically saved by Jesus Christ and has been delivered from many things herself. She is also an ex-drug addict, a pancreatic cancer survivor, dealt with abusive relationships and an abusive family. She also is a certified Drug and Alcohol Counselor in the Almond Tree Program as well as the Prepare/Enrich Marriage Counseling Program. Marsha counsels many girls and women, works with children and adults with special needs, and has a great passion to help others. Marsha is also available to talk to anyone needing help, counseling, or just someone to talk to. You can reach her at: 715-644-8376. If you would like to consider any of the above offers, please call our number or use our Contact Us page. We would love to hear from you, even if its to share a God sighting, testimony of your own, or simply share some feedback. It’s all about learning; every student, every staff, every day. Again, thank you Mr. Cole for coming to speak to our students. 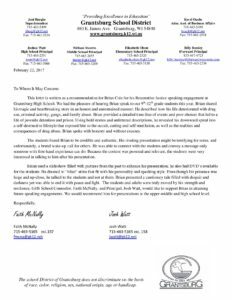 It gives me great pleasure to write a letter of recommendation for Brian Cole. The Mondovi School District was fortunate enough to have Brian speak to our middle and high school students on January 11, 2019. 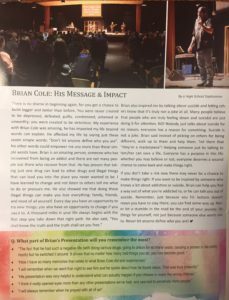 Brian’s past is such that he can sincerely talk to students about the importance of making good choices and what happens when this does not happen. Brian is a genuine person who is believable and every student that I personally talked to after his presentation was moved. What was critical to Brian’s story, was his ability to keep the audience engaged. It was nearly impossible not to pay attention when he was speaking. As I mentioned above, Brian has an almost unbelievable past. His battle and subsequent victory over many addictions, is a story that people need to hear. His specific examples from his past make his story genuine and credible. He does not mince words and is very blunt. 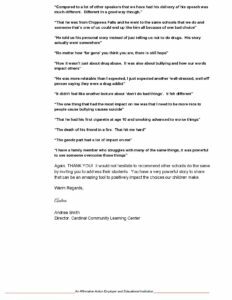 This probably is the most effective way to address addictions and choices with teenagers and young adults. During Brian’s presentation, he gave multiple ways of contacting him if a student had issues and would like further information or assistance. He also was speaking at a church later that same day if anyone wanted a more elaborate picture of his story and what ultimately was the turning point in his life. 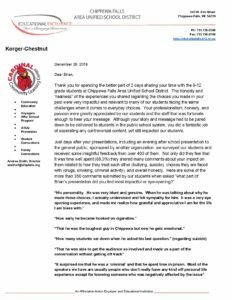 Mondovi High School and Middle School has had many speakers over the last several years. I believe Brian’s message was one of the most important that our student body has been exposed to. I highly recommend his presentation to any school district or group that would like relevant information given to their students. Brian’s passion for helping people is very evident and I believe will positively impact lives. Please feel free to contact me if you have any questions.